The Rangerbred horse is registered with the COLORADO RANGER HORSE ASSOCIATION,INC.-the oldest of the western horse breed registries still in existance in the United States. To meet the requirements for registration with the CRHA, a horse MUST SHOW A DIRECT DESCENT from one of the two foundation stallions, MAX #2 and/or PATCHES #1.
vations). The outcrossed mare must be registered with one of the above registries or show positive proof of parentage tracing to one of the registries accepted or a combination of the above registries (with approval). There is a hardship clause for geldings and spayed mares only.
. These stallions reached Virginia early in 1879 where they attracted the attention of one of America'sgreatest horsemen, Randolph Huntington. 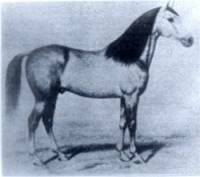 Mr. Huntington, already an old man who had spent thebetter part of fifty years breeding trotters and roadsters, saw in the two great desert stallions the opportunity to perfect his new breed of light harness horses, which he proposed to name the Americo Arab. General Grant gave his friend full permission to use the stallions as he thought best. The next fourteen years brought Huntington's new breed to a high state of perfection through the use of the Barb and Arabian blood. The introduction of the "horseless carriage" and other financial difficulties caused the complete dispersal of the fine Huntington horses (over a hundred head) in 1906. In 1894, General L.W. 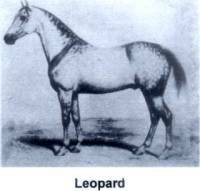 Colby, an old retired Army friend of General Grant, who had extensive ranchholdings in Beatrice, Nebraska, persuaded his old comrade to let him bring Leopard and LindenTree (now aged stallions) West for a single breeding season. Here for only one short summer the two desert stallions left an indelible impression upon the native mares there on the Colby holdings. Here was cradled the new breed of cowhorses later to be named the Colorado Rangers. Colorado horsemen were destined to write the next chapter of the Colorado Ranger story. 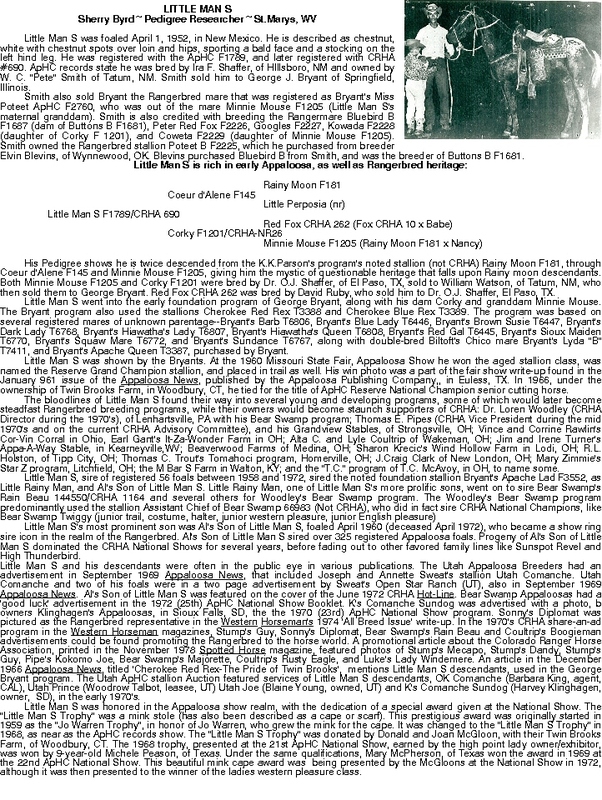 By the late 1890's many good reports had drifted across the cow country concerning the excellent horses being bred on the Colby ranch back in Nebraska. Several of the big outfits on the eastern Colorado plains decided to give the Colby horses a try. They sent one of the plains' most respected ranchers, A.C. Whipple of Kit Carson County, Colorado to the Colby ranch in Nebraska to buy a band of mares and a stud. Mr. Whipple returned with an outstanding group of young mares, all of which were sired by the Arabian stallion, Leopard, or the Barb stallion, Linden Tree. The stallion he selected, named Tony, was a snow white, black eared, double-bred grandson to the desert stallion, Leopard(AHR #233). This line-bred stallion was crossed on the Colby mares with remarkable success in the years that followed. These early breeders were not interested in creating color. They were cattlemen whose primary objective was to raise working cowhorses to meet their ranching needs. A wealth of odd, barbaric color patterns did, however, evolve from their intensive line-breeding program. Horsemen on the plains had never seen such leopard-spotted, raindropped horses before. The blanket-hipped and snow-flaked patterns shocked them. The next person of note in the evolution of the Rangerbred horse was a man by the name of Mike Ruby.He was born in Tavastock, Ontario, in 1886, and emigrated with his parents to the eastern Colorado plains at the age of three. It was theera of the cattle barons and good using horses were in great demand. 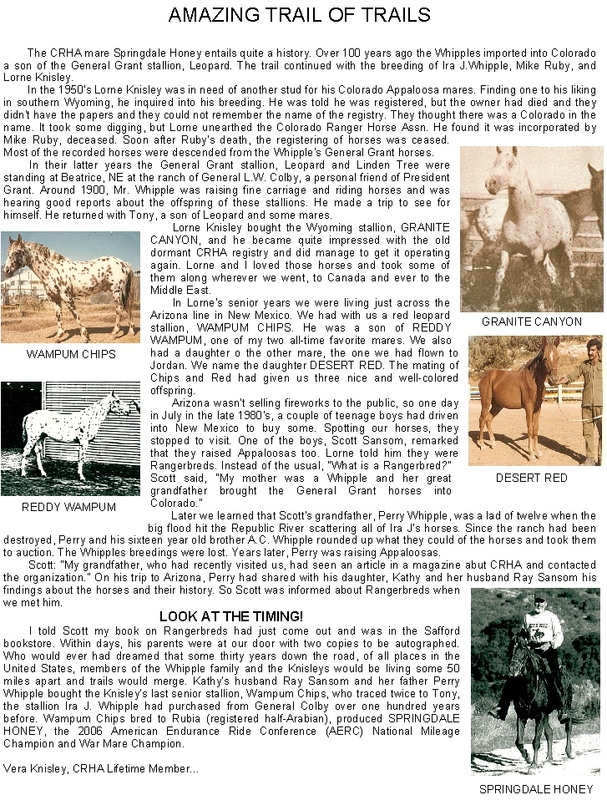 The Rubys were noted horsemen, and Mike took an early interest in the superior horses being bred on the Whipple ranch. The Whipples were carrying on an intensive line-breeding program with Barb-Arab seed stock which they had obtained from the General Colby ranch in Beatrice, Nebraska. These horses had a reputation of working ability, good dispositions, and plenty of stamina. 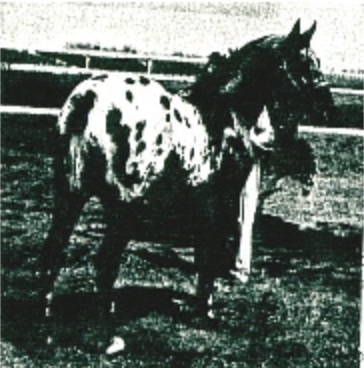 In the early 1930's, Mike Ruby, aquired Patches,a son of the stallion from the Colby Ranch (Tony), and Max, a halo-spotted son of the Waldron Leopard out of an Arabian mare, as his herd sires. By this time he had amassed a herd of more than 300 mares! With these two foundation sires, Mike began to build the breed. Both stallions left outstanding sons who went into the Ruby herd as sires. Of prime importance among these were Patches II, Leopard and Ranger who, as well as their own sires, figure in the pedigrees of most present day Rangerbreds. Mr. Ruby was different in many ways than many of the ranchers of his day...before most of the prominent registries were founded...., as he maintained accurate written records of his mares, stallions, and their offspring. At this time, these records including foaling dates, colors, and their complete pedigrees was indeed an 'unusual' practice. These handwritten records have been preserved as a part of the CRHA Corporate records. 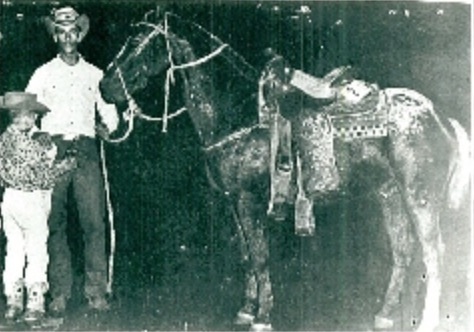 In 1934, Mr. Ruby was invited to display two of his stallions at the Denver Stock Show. The two leopard patterned stallions (Leopard #3 and Fox #10) were seen by thousands of visitors. Encouraged by the faculty of what is now Colorado State University, the new breed of horse was officially named ColoradoRangers, horses originating in Colorado and bred and raised under range conditions. Verbal references to those "range bred" horses eventually led to their being more commonly known as Rangerbreds, although the official name remains. With the naming of the breed came a breed registry. Mike Ruby founded the Colorado Ranger Horse Association in 1935. Two years later he applied to the State of Colorado for corporate charter which was granted on January 4th, 1938. Due to registration only being available to CRHA members and a fifty member limit imposed, many horses with Rangerbred heritage were not able to be registered with CRHA at that time. 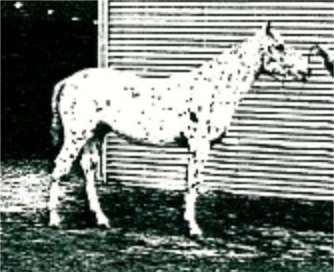 Those horses with color patterns, however, were gladlyaccepted by another breed registry that came into being several months later, The Appaloosa Horse Club. Mr. Ruby dedicated his life to thebuilding of a new American breed, and served as president of the Colorado Ranger Horse Association until his death in 1942. In 1964, the Colorado Ranger Horse Association lifted the fifty member limit and registration was opened up to all horses meeting the pedigree requirements, regardless of owner membership status. Since then, the CRHA has registered many of the Appaloosas with Rangerbred heritage that were "lost" to the organization for so many years. 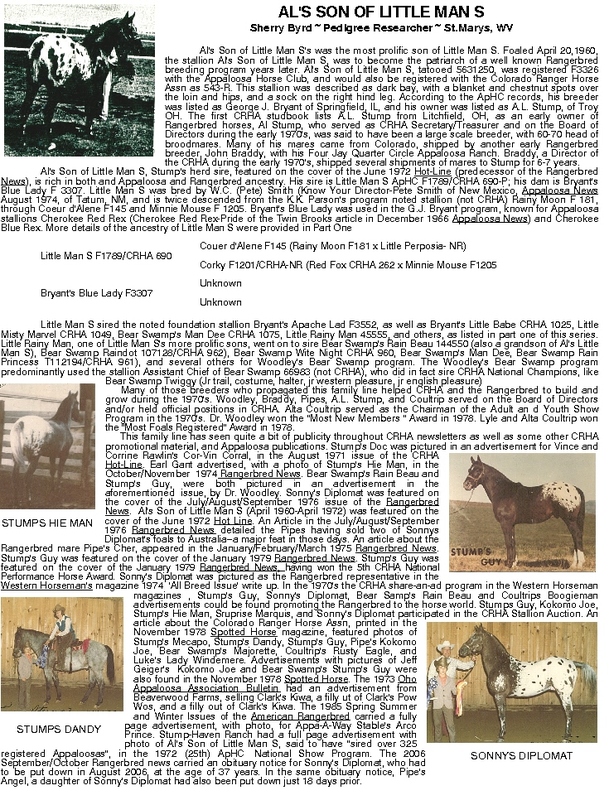 Additional Appaloosa bloodlines with Rangerbred connections are still being recognized through continued pedigree research. Most recent research indicates that one out of every eight Appaloosas is eligible for CRHA registry. Appaloosa pedigrees are checked for Rangerbred heritage by the organization at no charge to the horse owner.